NEW YORK (CNS) — There’s plenty of humor and action in the fast-paced sci-fi adventure “Ant-Man and the Wasp” (Disney). What’s noticeably lacking is any exposition or guidance for those not already familiar with the characters and their relationships from 2015’s “Ant-Man” and 2016’s “Captain America: Civil War.” While the film can still be enjoyed on its own, newcomers will feel somewhat left out as a result. One example of the potential confusion awaiting novices is the fact that, when we first encounter him, Scott Lang aka Ant-Man (Paul Rudd, who also co-wrote the script) is approaching the end of a two-year sentence of house arrest. That’s the consequence, we learn, at least by implication, of his activities in the latter of the two previous movies. But specifics on what exactly he did are not shared. Whatever his wrongdoing, Scott — whose alter ego, thanks to a high-tech suit, can shrink or grow at will — is now anxious to focus on serving his time and raising his young daughter, Cassie (Abby Ryder Fortson). Scott’s good resolutions are undermined, however, when his predecessor as Ant-Man, Hank Pym (Michael Douglas), and Pym’s daughter, Hope (Evangeline Lilly), aka the Wasp, draw him into their quest to rescue Hope’s mother, Janet (Michelle Pfeiffer), the original Wasp. Janet been stuck for decades in the Quantum Realm, a kind of subatomic limbo. To retrieve her, the trio will have to do battle with two principal enemies: Sonny Burch (Walton Goggins), a petty gangster out to profit from Pym’s technological breakthroughs, and Ghost (Hannah John-Kamen), a victim of Pym’s past misdeeds. They’ll also have to stay one step ahead of Scott’s jailers, led by S.H.I.E.L.D. agent Jimmy Woo (Randall Park). Altruism and family bonds are showcased in director Peyton Reed’s Marvel Comics adaptation. As flashbacks show, for instance, Janet’s plight came about when she voluntarily entered the Quantum Realm, knowing she would not be able to return, because it was the only available means of averting a major catastrophe. Scenes illustrating the warm affection shared by Scott and Cassie, moreover, are likely to charm audiences. The screenplay — on which Rudd collaborated with Chris McKenna, Erik Sommers, Andrew Barrer and Gabriel Ferrari — also sends a clear message about ends not justifying means. Thus Ghost, who is suffering from a molecular malaise, believes that the energy Janet has absorbed during her exile will cure her, and is willing to endanger Janet’s life to achieve this. The dialogue consistently labels this attitude morally unacceptable. Less congenial for viewers of faith is the fact that the central romance between Scott and Hope, while it represents a positive partnership, develops in the wake of Scott’s split with Cassie’s mom, Maggie (Judy Greer). Maggie, too, is shown to have moved on from their marriage. Though these factors are kept in the background, they still contribute to ruling this out for impressionable kids. 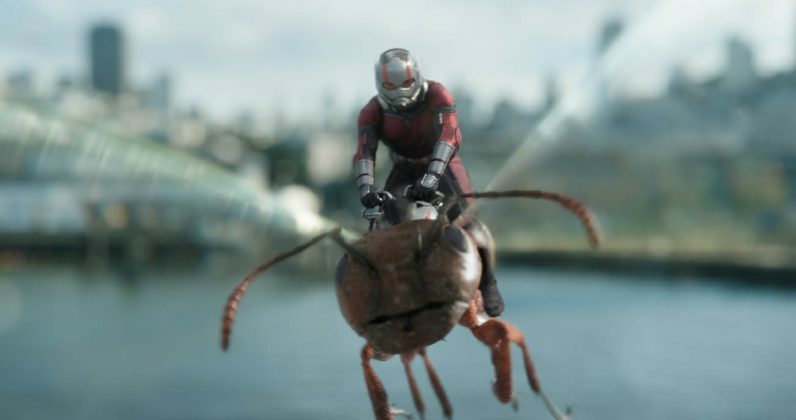 Given its relatively restrained mayhem and infrequent lapses into cussing, though, “Ant-Man and the Wasp” is possibly appropriate for older teens. The film contains much stylized violence, acceptability of divorce, a couple of uses each of profane, crude and crass language, several milder oaths and occasional wordplay. The Catholic News Service classification is A-III — adults. The Motion Picture Association of America rating is PG-13 — parents strongly cautioned. Some material may be inappropriate for children under 13.